Apple trees are a lot like people; plant them in the wrong place and they just aren’t happy. What’s great for one apple tree may be intolerable for another. That’s why one of the most important things you should do before planting any fruit tree is to research the best varieties for your region. The photo above is glaring example of how two apple trees planted side by side can perform so differently in the same climate. While both are originally from England, in my orchard they are world’s apart. 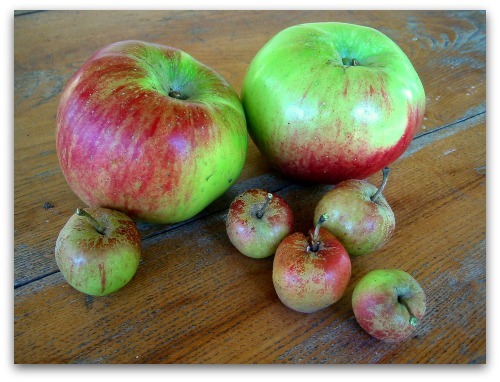 Bramley’s Seedling is a robust grower and producer of large, tart blemish-free apples. 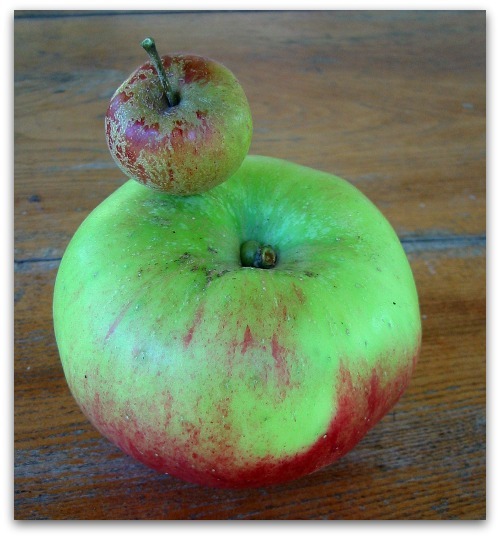 Cherry Cox Pippin on the other hand is the orchard weakling, prone to disease, and fussy about weather, water and sun. I don’t spray my apple trees, so disease resistance and vigor are important attributes when I choose a new variety for my orchard. The next time you want to plant a fruit tree, choose wisely grasshopper. Look to the experts in your area, like extension programs, garden forums and nurseries. As gardeners, we’re a chatty lot and always looking to toss in our two cents about what works and what doesn’t in the garden, orchard, meadow or pond. And look to universities, where research and studies highlight best practices and how-tos. The more you know the farther you grow. GardenWeb Forums: Search by topic or region to find gardening answers or post a question. Boz, part-time telekinetic practitioner, believes it’s only a matter of time before those Jonagolds hit the floor. 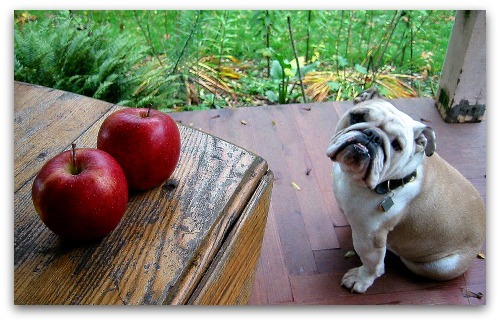 BOZ is sooo cute…My golden retriever ‘Lucky’ is an apple connoisseur as well. “Come hither my delicious friend”. Give Boz the tiny apples. He can eat those like doggy treats. You are the pie baker extraordinaire! What is your “apple pie apple” of choice? Pam, my favorite baking apples when picked fresh are York, Bramley’s Seedling, and Jonagolds. When I buy apples at the market for pie, I mix Golden Delicious (Julia Child’s favorite) and Granny Smith, makes a nice combo of sweet and tart. Hahaha…that’s a pretty glaring example for your point! Boz is not only handsome he is smart too. Nothing is better than a firm, tart, crisp apple. (Tall Clover Raspberries are the exception). Here in South Florida that perfect apple is little harder to find. Enjoy the delicious varieties. What a fantastic reference, Tom. I’m tweeting this – thanks for the great links! Hi Tom, Thanks for your input regarding your favorite “bakers.” I have just made a “Jonagold galette.” Critique to follow after tonight’s dinner!